NAKHON SI THAMMARAT, Thailand — Thai authorities suspended ferry services and evacuated locals and tourists ahead of a tropical storm expected to pound the Southeast Asian nation’s famed southern beach resorts during a peak tourism season. In a death possibly related to the storm, a Russian tourist in Koh Samui died Wednesday as he tried to rescue his daughter, who was struggling in strong surf. Thai PBS television reported that the daughter survived but her father lost consciousness after being tossed against some rocks and couldn’t be revived by rescuers. 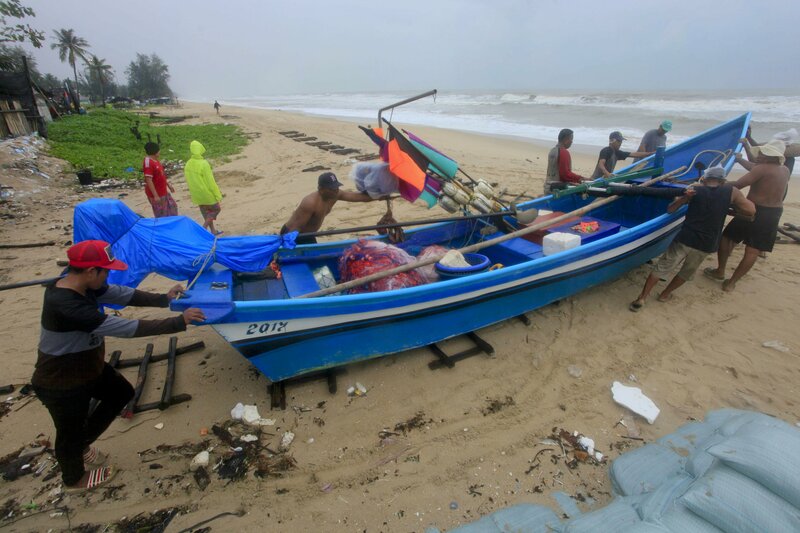 Thailand’s Meteorological Department said the storm will lash southern Thailand’s east coast through Saturday, with the two provinces of Surat Thani and Nakhon Si Thammarat expected to be hardest hit. Surat Thani is home to the popular tourist islands of Koh Samui, Koh Tao and Koh Phangan. “We have prepared three shelters and currently have about 1,000 people in them,” said local official Kriangsak Raksrithong. He later held a video conference with governors of provinces in the storm’s path to discuss preparations for the emergency, including draining floodwaters, mobilizing rescue vehicles, and readying medical facilities. Anne Britt Sodefjed, a tourist from Norway, said she wasn’t worried. “We have bought lights, yes, and some more water. And we know the hotel will look after us,” she said. Southern Vietnam also was expecting heavy rain and strong winds in the Mekong Delta, the country’s major area for rice and aquaculture production.